…Because my pants don’t fit. Because what I really want is pumpkin pie. Because I haven’t eaten anything green for five days. Because I haven’t really felt hungry since before Thanksgiving. Oh, the shame! 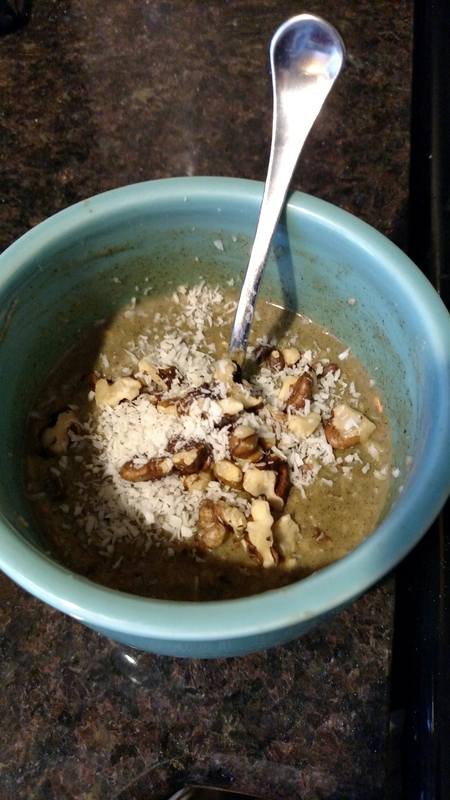 With the weather turning colder I thought I might want a break from smoothies, but…without a healthy green smoothie to start my day I kinda fall apart (nutrition wise). Here is a smoothie adapted from Green Thickies. Just like most recipes, I don’t have all the stuff that goes into her smoothie, so I do what I can. Usually I eat pears, if I can wrestle them from my husband or oldest kid, but I have been buying pears with a purpose lately. Yeah! I had a ripe pear that no one knew about and into the smoothie it went. If your pears are small you might want to add two. Blend milk, cider, oats and dates. Then blend in protein powder and greens. Add fruit, spices and vanilla, blend until smooth. I find I have to do T-Tapp right before I drink my smoothie so I don’t get too cold. Does this have FRUIT in it? After the In-N-Out diet my sweet husband stated that he wanted to go on the green smoothie diet with me. Which means that I have to make him a smoothie when I make myself a smoothie. He won’t drink the same smoothies I drink because…they have fruit in them! I think he might be confusing smoothies with milkshakes. This morning he was a bit concerned because I didn’t add cocoa and peanut butter to his smoothie, so it was green! He looked at me and asked “Does this have fruit in it?” No my love, I make your smoothies out of ice cream and candy bars, but don’t worry you will still lose weight because you are a man. Before his smoothie this morning he ate a Payday bar and after his smoothie he had an apple strudel. And he will still lose weight. I’m feeling a little catty this morning. I will drink my Spirulina Smoothie, (I used lime juice instead of lemon and added a mango, super yummy!) have a large glass of water, take deep breaths and smile. Ah, that feels better. Good thing my bad moods don’t last long and as long as I share them on my blog no one else has to be in a bad mood either! Thank you one random person who reads this! You just helped save my marriage. So, here is the only green smoothie my husband will drink. It might work for kids too! Blend in the order given. Make sure to blend the spinach before you add the next ingredients or it won’t fit in the blender. Sometimes I add 2 tablespoons of coconut butter and leave out the cocoa or it would be good to sub the peanut butter with coconut butter and still add the cocoa. Don’t tell my husband this has a milk beverage or a banana in it because then he won’t drink them anymore.